Have you ever forced yourself to go to the gym, and you despised every minute of it? Somehow, you continue to go and torture yourself because you know that it’s supposed to be good for you. How is it that other people enjoy exercising so much? I’m sure you already know that if you do not enjoy what you’re doing, you probably won’t be doing it for very long. Don’t worry, there’s still hope for you. The solution is simple. You need to find fun ways to exercise so that you can integrate this important activity into your daily routine. If you absolutely hate exercising, you are not alone. Research is emerging that shows your genetics may play a significant role in whether or not you enjoy physical activity. If your parents were athletes, you are more likely to be an athletic person too. Animal breeders take advantage of this known phenomenon. They selectively breed animals that have consistently demonstrated tremendous physical qualities such as strength and speed, to create offspring with these qualities as well. There is also a neurochemical component to exercise. Your genetics can also play a role in how much dopamine gets released whenever you participate in physical activities. The more dopamine you have, the more you’ll feel good from doing that activity, and therefore the more likely you’ll continue to do it. 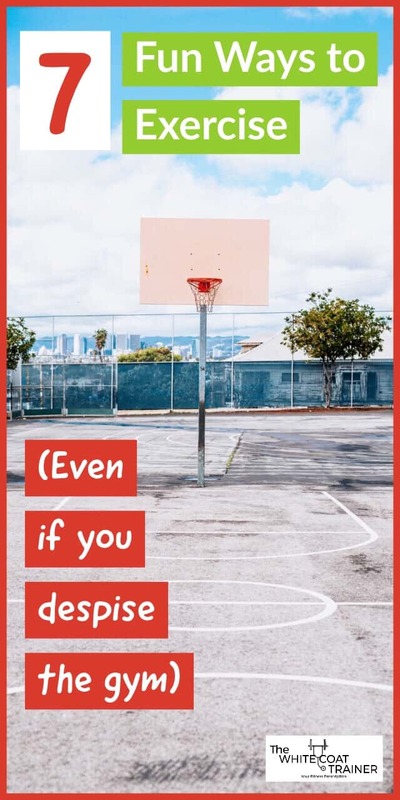 So, what if your parents were athletes but you still have no desire to exercise? Your environment may also be contributing to your lack of enthusiasm for working out. These can include a lack of motivation from having to start from a different baseline from your peers. (i.e. Some people are naturally lean, while others may be naturally heavier). It is not uncommon for individuals to simply feel bad about their bodies. We are constantly fed a highlight reel of other people’s lives with pictures that capture their bodies from the perfect angle with the most perfect lighting. Or perhaps the time commitment necessary to achieve fitness related goals just don’t seem appealing to you and you rather spend your time doing other things. Whatever the case may be, you must realize that exercise isn’t meant to be for aesthetics or for athletic endeavors. Exercise is part of your genetic makeup. 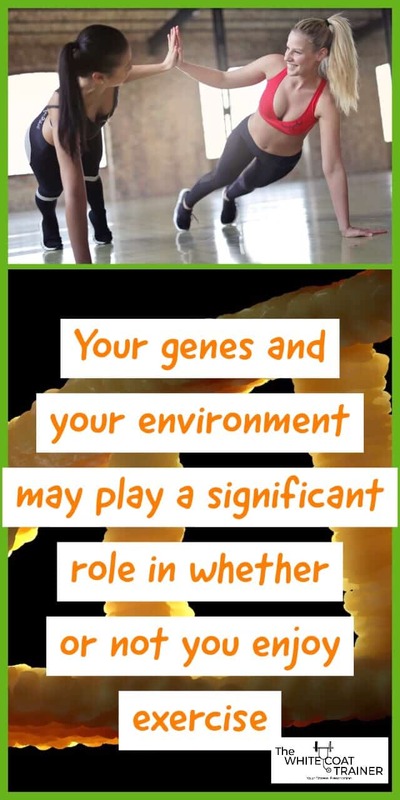 Your genes expect you to move around because that is how our body is designed. It is not meant to be sitting for the whole day. If you do not exercise or engage in physical activity, you are going against your genetic underpinnings. But What If I Hate The Gym? The gym can be a big source of anxiety for many people. The good news is that you don’t have to workout in the traditional sense to get the benefits of exercising. There are many ways that you can exercise to improve your health and fitness instead of running on a treadmill and lifting weights. 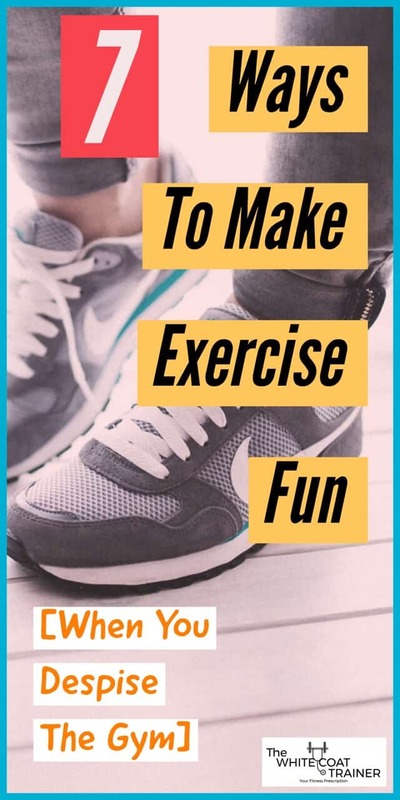 With that said, there are several strategies that you can use to make resistance training fun, which we describe in How To Make Time For Exercise When You Work 16 Hours A Day. But if the gym isn’t going to cut it for you, then there are some alternatives. The key is to find something that you enjoy. Do not forget, in the world of fitness, some type of movement is better than no movement. Studies are showing that being sedentary plays a much larger role in negatively impacting your health than not actively working out. You have to make fitness fun. This means different things for different people. Find a few activities that you enjoy, and that you can do often (3-4x a week). The key is that you have to enjoy the activity. The more you enjoy it, the more likely you will stick with it. The activity doesn’t have to be complicated, it doesn’t have to be difficult and it doesn’t have to be of long duration. I recommend 20-30 minutes at a time, but if you can only do 10 minutes so be it. Busy professionals don’t have a lot of time to waste. Do whatever amount you can fit into your schedule. Anything can be classified as exercise so long as you are constantly moving, and your heart rate increases from your baseline. You can make it as intense or as controlled as you’d like. Increased heart rate means more oxygen use, increased energy expenditure, and increased metabolism. Here are some simple alternatives to going to the gym. Try and mix and match activities that you enjoy, so that you can be exercising at least 3 times a week. It requires no equipment, very little time commitment, and it also gets you to where you need to go. Far too many people underestimate the tremendous benefits of walking. We have written an entire 2000 word post on walking which you can find at How A Daily Walk Can Improve Your Fitness [& Help You Lose Weight]. How could walking actually be fun? Walk through a different route every day. Explore a new area you haven’t been to. Can’t go outside? Then get on a treadmill and walk up an incline for 20 minutes while listening to a podcast. Stuck at work? Create a challenge that you will always take the stairs on Mondays, Wednesdays, and Fridays. I have my qualms about running, (namely because I think it is a waste of time which we discuss in Is Cardio Actually Necessary? 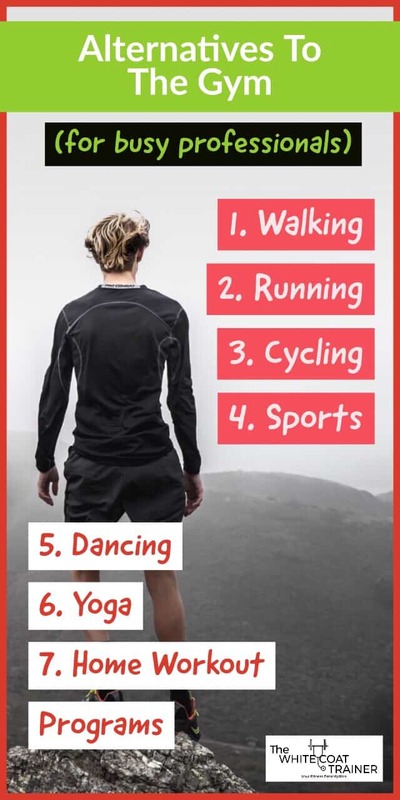 5 Reasons Why I Don’t Do Cardio) but if this is the only type of exercise that you enjoy, then by all means, keep doing it! Take a 15 minute jog 3-4x a week. Jog to the park and back on your off day. Brittany loves her bike. At one point, she was biking to and from work every single day (she now works too far from home, otherwise she would still be doing it). Biking is one of the best forms of exercise you can do. It provides a great deal of resistance training to your legs and it revs up your heart rate quickly. In addition, it gets you to your destination quickly! Is it feasible to bike to work? If not, go on a nice 30 minute bike ride on your off day and go for a long walk 2-3 other days of the week. Playing team sports is another great way to add physical activity into your daily life. Find a sport you enjoy and do it with a few like-minded friends. There’s nothing like a little friendly competition to make any physical activity fun. The most popular activities include basketball, tennis, frisbee, dodgeball, baseball and football. All you need is 20-30 minutes a day. If you play sports once a week with friends, do some other physical activity from this list on 2 other days. Anyone who has danced knows that it requires a great deal of physical exertion. Find a dance studio and participate in weekly events. Learn how to do salsa. There are numerous ways you can get involved. No one ever comes out of a dance session without having had fun. Some people absolutely love yoga. It can improve your posture, your flexibility, your balance and promote relaxation. Yoga studios are popping up all over as it becomes increasingly more popular across the country. You can pay for group sessions, find free studios, or follow an at home session from a DVD. Either way, it is a great way to get some physical activity into an otherwise sedentary day. You can also purchase a home workout program that you can do from the comfort of your own living room. Popular examples include P90X and Insanity. These workout sessions can be extremely fun as the videos make it feel like you have your own personal trainer at your house, and you know that there is an endpoint. Having a finite goal (such as completing a 90 day program) gives you the motivation to keep going. We also have a home workout program that you can do in as little as 20 minutes a day! Okay, this one actually involves a gym but hear me out. Powerlifting is one of the most fun activities you could participate in. It involves trying to increase your strength in three specific lifts: The Squat, The Bench Press and The Deadlift. There is nothing more satisfying than seeing your hard work result in actual measurable progress in your lifts. Powerlifting has helped many individuals find fulfillment in their lives and feel comfortable with their bodies. It’s actually how Brittany and I really got focused on exercise and fitness. (*it should go without saying that you must utilize proper technique when performing any of these exercises*). Check out our strength program to learn how we workout and keep things interesting. This list is not comprehensive. There are so many more physical activities that you can do, but I wanted to keep them actionable and something any busy professional could do. 20-30 minutes a day of any of these activities is more than enough to satisfy your genetic requirements! Most of these activities can be done on your own time and without the need for a gym. Regardless of how busy you are, and how much you hate exercising, there is always something that you can do. Take control of your fitness today. Lastly, there is one final thing you must understand before you begin exercising. Stop embracing the idea that you need to look a certain way and that exercise is how you will achieve the perfect look. The truth is, you may never look a certain way unless your body has the genetic makeup to do so. You will never look like the Rock because you are not the Rock. You will never look like Kendall Jenner because you are not Kendall Jenner. Everyone’s body is completely different. When you exercise, you will begin to look the way your body is meant to look. Stop idealizing celebrities or those people who are insta-famous. 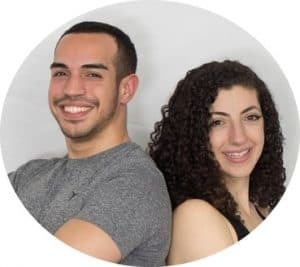 Adobe photoshop and taking numerous photos with different lighting can help these individuals achieve whatever look they want. No one looks like that in real life! Studies are also starting to show that social media may be harming our perception of body image, particularly in women. Don’t exercise simply because you want to look a certain way. The changes in your physical appearance are just a side effect or a byproduct of exercise. I promise you, you will begin to develop a great deal of personal satisfaction with your body, regardless of how you look! Focus on doing an activity you enjoy so that you can perform at the level that you desire. Enjoy the exercise you do so that you can continue to run and to move swiftly even in your late 60s. Enjoy the exercise you do so that you can play with your grandchildren and not experience a stress fracture while doing so. If you hate exercise, it’s probably because you are doing the wrong type of exercise. The only way to make exercise a habit is to constantly participate in it, several times a week. Far too many people rely on motivation to keep them going, but motivation is an expendable resource. If you participate in a form of exercise that you enjoy, you are more likely to continue doing it over a long period of time, and hopefully, for the rest of your life. After a while, exercise and physical activity becomes just as normal as brushing your teeth. So go do yourself a favor, and go do what you enjoy most. That way, you can you can focus your mental resources on your busy profession, and not on exercise guidelines. Do you go to the gym because you feel that it is an obligation? Would you do any of the physical activities listed above regularly? Which of these physical activities do you find the most fun? Don’t forget to Share this article if you found it useful.